Yes Melbournites, go grab the paper today, not tomorrow, and you’ll find DA in the A2 section of The Age, which has been published a day early. I suppose DA is also making his customary appearance today in the SMH as well. Come what may, the etiquette still stands: no spoilers here till Monday. Another piece of thematic brilliance by DA. I do think certain clues were questionable, nevertheless I can’t remember ever having felt such a thrill on discovering the theme after not quite understanding how the EL AL and SPARSELY clues worked. A delight to be talked about for generations. Season’s greetings from DA today! This one will probably go in the Pantheon. Not for the faint-hearted. 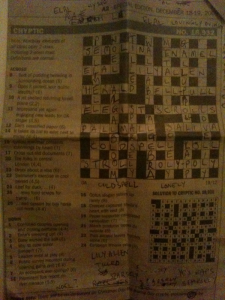 SMH is weekend edition with DA crossword in News Review section and DS in Spectrum. OMG, I just worked out the theme. I can confidently say the following without having done even a quarter of the crossword: Ian’s right, this will be part of the DA Pantheon. Please Note: There will be no crossword on Christmas Day. 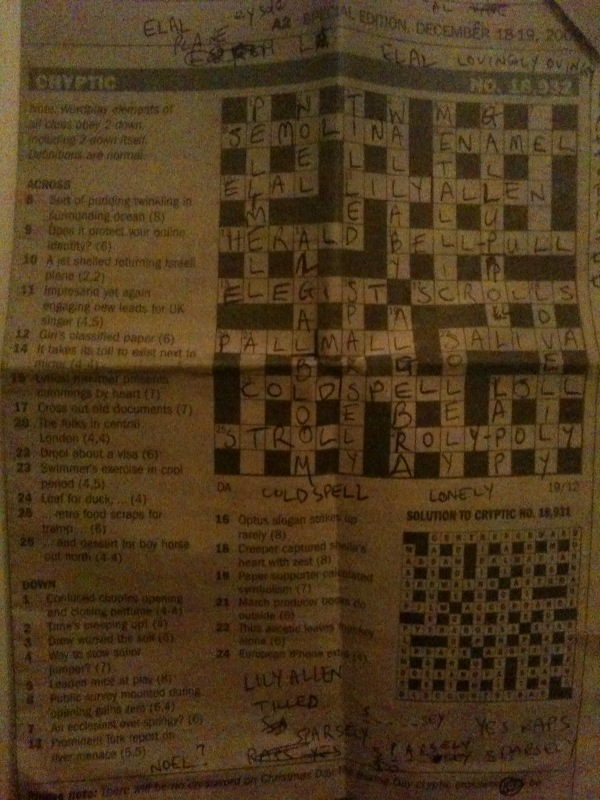 The Boxing Day cryptic crossword will be composed by DS. a (hopefully themed) DA. Oh, well. Finished! Great stuff and full of gold. Hard to name an ordinary clue. Bloody ‘ell! What a cracker from DA this week. Once again full of “stuff”. Can’t wait for Monday’s postmortem. Thanks, DA, for the Xmas present. A beauty. For some reason it’s always the SE corner that gives me trouble, but having it a day early should leave enough time to finish before Monday. What an absolute delight! Most enjoyable. (Apart from 2 or 3 minor complaints). Maybe because the wordplay already had the added complexity of the 2-down “theme”, I thought DA made most of the definitions and wordplay a bit less obscure than usual. My favourites: 20A, 26A, 7D, 19D, 22D. 12A and 19D deserve a mention as well, given the location! This one was a beauty though it did take me till Sunday afternoon to get it finished. Thanks for the crossie via iphone photo mail, AS. EC and I have been bringing the joy of DA to the New World. My new in-law were suitably impressed. EC got the theme, initially thinking it must be something like “adel” before we commenced slapping our foreheads. We havent finished it yet, but we’ll give it another shake in the Huastecas over the next few days. Hope the house-sitting isnt too taxing. An absolute ripper. Still working my way through it, but quietly confident!